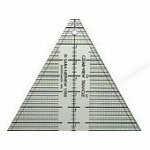 Use in speedpiecing methods to produce any patterns or shapes based on 30, 60, or 120 degree angles. All triangles are ruled in black every 18". Lines are guaranteed to last.